Wicked Makers are creating awesome DIY videos! We're Jay and Jaimie! 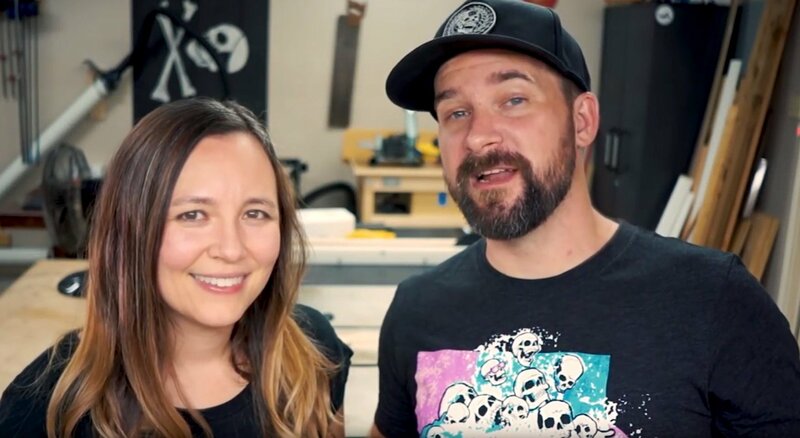 We're a husband and wife maker team in Austin, TX who host the Wicked Makers YouTube channel. We create high-quality free videos on YouTube where we make things like woodworking, Arduino/electronics, props, CNC/X-Carve, tabletop/DnD gaming terrain, costumes, and all sorts of other awesome stuff that inspires us. We love to inspire, teach, and entertain, and support from you helps us pay for things like materials and supports our channel. Jay has worked in the video game and animation industries for over 12 years and currently leads the product team at Faceware Technologies. Jaimie has a background in special effects fabrication, spent 8 years working at DreamWorks Animation, 2.5 years doing marketing for Rooster Teeth production studio, and is currently a full-time mom and maker. What kinds of projects do we make? Our video projects include woodworking, Arduino and electronics, Halloween props, 3D printing, CNC/X-Carve, tabletop gaming miniature and terrain painting, and a whole lot more! We try to highlight our mistakes as much as our victories so you can learn from our process and be a part of all the ups and downs on the journey of taking from an idea to a reality. How can you help? Become a Wicked Patron! Since we began our YouTube journey, one thing has always been very important to us: to make videos that are entertaining, bring value to the viewer, and are as high-quality as we can muster. By becoming a Wicked Patron, you'll be contributing directly to the production of higher quality content on the Wicked Makers channel. Your backing supports our equipment, our software, and helps us spend as much time as possible on the videos and content. Our Patron-only feed. Work-in-progress videos, updates on projects, and other rad stuff only available to Patrons. 5% discount on Wicked Makers merch! 10% discount on Wicked Makers merch! Access to our monthly ZOOM/Google Hangouts Q&A! Ask us about anything, talk about projects, geek out about Lord of the Rings, whatever! 15% discount on Wicked Makers merch! Access to our monthly ZOOM/Google Hangouts Q&A! Ultimate high fives! Thank you!! So far everything we've done is just with some basic point and shoot cameras and our phones. It gets the job done but it's part of the reason it takes us so long to make new videos. Your support will help us upgrade our equipment and speed up our video making process!